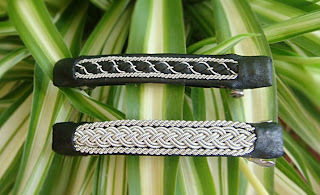 Sami Jewelery: Not just bracelets, introducing - barrettes! I am a big man in every sense 47yo trapped by the beauty of simplicity and liking did some puukkos knives, which led me to Scandinavia,to Finland and at least to Inari. Following the thread of macrame to your blog, beauty dazzles me and your ability, skills and sensibility. Hug from the heart from Argentina. Keep walking your way, its pure and clear.